Mathematics Stage 1-3: Focuses on working mathematically across all areas of the syllabus. Problem Solving. English and Drama: Circus & Storytelling. The Greatest Circle Show on Earth! 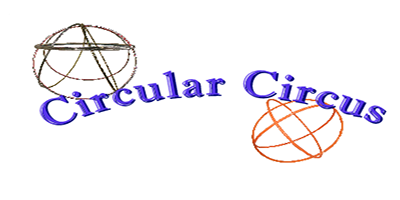 Have all the fun of the fair as you join Circular Circus and experience how mathematical concepts are part of everyday life, even at the circus. The Ringmistress, Heidi Hoops is ready to amaze you with circus tricks of all proportions and dimensions. The show features sensational hoop tricks including; the most, the hardest, the biggest, the smallest, the weirdest, and the most dazzling. Meet all her crazy characters including the kooky magician, the silly strongman and the whacky professor. Hold on to your seats because she will crack a whip so fast (1236km p/h) that she will break the sound barrier, defy gravity by propelling unusual shapes up into the air, and use chance to create the most original routine possible (1/46,656 combinations). She will also defy logic and squish a humungous number of rather tiny students into a rather large cube, as well as use the age old "magic of numbers" to bend your brain around a corner. It's a race against the clock, as she only has 45 minutes to complete the show. Students will need to read the time, observe patterns, gather data, and employ their skills of counting, fractions, arithmetic, probability, measurement, co-ordinates and geometry to help Heidi finish on time. She will also need the critical and creative thinking of the older students to help her complete the show’s incredible interactive group routine, The Spectacular Geometric Set. With loads of audience participation, comedy, magic, rope tricks, illusions, juggling, whip cracking, lasso spinning, fabulous costumes, loads of hula hoops and a spectacular finale (LED Light-up flashing hoops). This exciting show will get kids excited and curious about maths. The concepts can be explored further in class with the 80 page education kit designed for stage 1 - 3+. Heidi is so talented, engaging and enthusiastic! She knew all her material so well and delivered a fantastic show with amazing tricks and skills. Liz Snell. K-6. St Barbara’s Parish School. SA. May 2018. Very engaging and age appropriate. Loved the maths focus but the kids generally loved hearing about the different areas of maths. Megan Sommers. 1-6. Our Lady Help Of Christians School. VIC. Mar 2018. Price: $5.00 per student (No GST Applies). Minimum Audience Size: 130 students. Times: 50 minutes + question time. Set up: 50 minutes. Pack up: 50 minutes. Requires an indoor performing area 6m deep x 8m wide x 6m high. Heidi Kim Hillier ABN: 18 031 835 924.